Virtually everything Islamist activists in the United States claimed about Tuesday's fatal shooting of terror suspect Usaama Rahim in Boston appears to have been debunked within 24 hours. Authorities say they shot Rahim, 26, after he repeatedly lunged at them with a military-style knife as they tried to question him. The skepticism was fueled by online posts by Rahim's brother, Imam Ibrahim Rahim. His claims, which fueled the immediate and reflexive condemnation of the Boston police and FBI, turned out to be wrong. Usaama Rahim was not shot in the back. He was not on the telephone with his father when he was shot. Law enforcement did back up and give Rahim several opportunities to end the confrontation peacefully. Officials showed the surveillance video proving this to a group of Boston community leaders Wednesday. "We're very comfortable with what we saw," said Urban League President Darnell Williams. 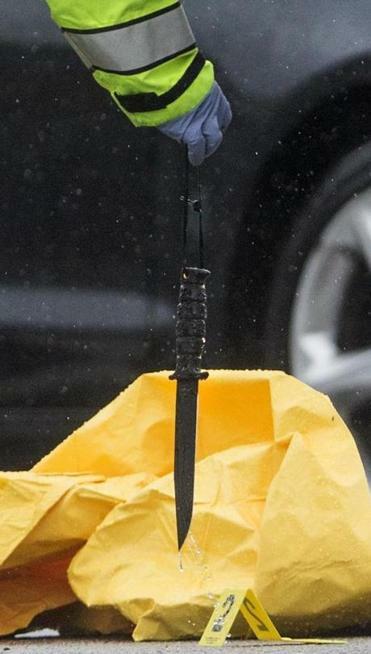 While those who saw the video say it was too grainy to see the knife, a Boston Globe photograph shows a long knife being removed from the scene. In a criminal complaint unsealed Wednesday afternoon, FBI Special Agent J. Joseph Galietta wrote that Rahim bought an Ontario Spec Plus Marine Raider Bowie fighting knife and an SP6 Spec Plus Fighting Knife from Amazon in the past week. In conversations recorded by the FBI, which had Rahim under constant surveillance for months, Rahim and a friend discussed beheading someone outside the state of Massachusetts. That changed in a 5 a.m. telephone call Rahim made to friend David Wright Tuesday morning. He said he no longer was interested in beheading the target previously discussed. "I'm just going to ah go after them, those boys in blue," Rahim allegedly said in the recorded conversation. "Cause, ah, it's the easiest target and, ah, the most common is the easiest for me..."
Wright then advised Rahim to destroy his computer and smartphone "Because, at the scene, at the scene, CSI will be looking for that particular thing and so dump it, get rid of that. At the time you are going to do it, before you reach your destination you get rid of it. That suggestion prompted the complaint against Wright charging him with conspiring to obstruct an investigation. Once arrested, Wright waived his Miranda rights and verified agents' beliefs that cryptic conversations they heard between Wright and Rahim were about plots to kill people. When Rahim pulled the knife Tuesday and officers told him to drop it, Rahim replied, "you drop yours," Galietta wrote. Thus far, none of the activists who jumped to an erroneous conclusion Tuesday, who unrealistically expected a full accounting of the incident within hours, have acknowledged their error. Arab American Association of New York Executive Director Linda Sarsour minimized statements by Boston religious and political activists who reviewed the video of the Rahim shooting. "If you haven't seen the video of killing of #UsaamaRahim, don't talk to me about it," she wrote on Twitter. "I don't know what it shows or doesn't show. Questions still remain," she wrote in a separate post. The Council on American-Islamic Relations (CAIR), which routinely criticizes counter-terror investigations as unjust and rooted in prejudice, issued a news release seeking an "independent and thorough" investigation, saying it has a "duty to question every police-involved shooting to determine if the use of deadly force was necessary, particularly given the recent high profile shootings of African-American men." If history is a guide, CAIR won't accept the findings no matter what. It sought, and obtained, an independent investigation into the 2009 shooting of Detroit imam Luqman Abdullah. In 2010, CAIR asked for, then rejected, investigations by the Justice Department's Civil Rights Division, the Dearborn Police Department and Michigan attorney general's office after an imam was shot and killed after he fired on a K9 dog leading an FBI SWAT team. It sought, and obtained, an independent investigation into the 2013 shooting in Orlando of Ibragim Todashev, a friend of Boston Marathon bombers Tamerlan and Dzhokhar Tsarnaev. Investigations by the Justice Department and an independent Florida state attorney conclude that Todashev, a "skilled mixed-martial arts fighter," tried to attack agents shortly after acknowledging having "some involvement" in a 2011 triple homicide in Massachusetts also under investigation in connection with the Tsarnaevs. Todashev reportedly heaved a coffee table, striking an FBI agent in the head before grabbing a five-foot-long metal pole over his head "with the end of the pole pointed toward [the FBI agent] as if intended to be used to impale rather than strike." The agent shot him three times, but Todashev again tried to charge, prompting the agent to fire three or four more shots, killing Todashev. The Justice Department review reached the same conclusions. It noted that Todashev's half-written confession was found at the scene. "The last sentence that Todashev wrote on the tablet of paper specifically related conduct by him that acknowledged complicity in the crime," the DOJ report said. "The only person who can contradict the government's narrative is now dead and the investigation into his death relied on evidence gathered by agents of the same agency involved in his death," CAIR-Florida official Hassan Shibly said. Shibly, an attorney, is now involved in filing a wrongful death claim against the FBI. 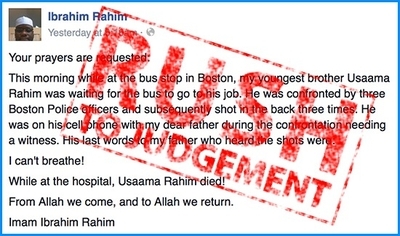 He did not comment on Tuesday's shooting in Boston, and Shibly did post an acknowledgement that the video shows Rahim was not shot in the back as claimed. CAIR Michigan chapter leader Dawud Walid, who posted comments skeptical about law enforcement, made no direct statement about the new disclosures Wednesday after the activists spoke about what the video showed. Earlier, he lumped Rahim in with Abdullah adn Todashev. San Francisco chapter official Zahra Billoo challenged someone who urged restraint in pre-judging the situation and dared to mention the rule of law. So far, all the emerging information backs up law enforcement claims about Rahim and debunked the Islamist narrative. But the damage here may be immeasurable. The inaccurate information plays right into the hands of ISIS and other radical Islamist recruiters. The reckless, false narrative fuels the notion of the West's alleged war on Islam, that Muslims must wage attack to protect the lives of their brethren. That is the ideology that motivated the terrorists responsible for the Fort Hood shooting and the Boston Marathon bombing, among others. CAIR and other Islamists say they are merely asking questions. Next time, perhaps they can at least wait for an autopsy before spreading false, inflammatory gossip. All lives matter. . .
Granted Black lives matter; so do the lives of Asians, Hispanics, Whites, Indians, and animal creatures too. All life matters! Instead of organizing an army of anarchist; try organizing a movement for the preservation of Natural Law. Natural Law pretty much covers how all beings exist with one another. We need to become her shield, we need to distribute the threat against her on a LARGE number of volunteer-targets.